On August 19, 2017, Spanish School for Residents and Expats celebrated its 7th anniversary at the school (co-located with the home of the directors). The celebration started at 11:30 AM with a party for students and families. Many stayed the for the entire party (until about 11:30 PM) and others came for a few hours. Students brought food from their native countries to be shared with all. There were about 80 total folks throughout the day – students and families. The following countries were represented: Germany, Canada, India, Nepal, USA, Brazil, Lebanon, Norway, England, Australia, New Zealand, Holland, Denmark, Lithuania and probably a few more. This is one of the many things that Spanish School for Residents and Expats does beyond just teaching Spanish. They feel that it is important for students to have the opportunity to meet others living in Costa Rica. Many times, students have just arrived in Costa Rica and don’t know anyone. This and other events, like student dinners at local restaurants, give students the opportunity to meet others and have a more enjoyable experience living in Costa Rica. This is also an opportunity to meet those from other countries, learn some of their customs and try some of their local dishes. The party was a great success – evidenced by the photos below. As I mentioned, the anniversary party is just one of the things that we do for students beyond the classes they take. We offer Free Live Classes on a variety of topics (irregular verbs, regular verbs and others). Students can attend the “Live Class” or view the class when they have time via YouTube. We also have dinners at local restaurants from time to time and invite students. This is an excellent way to meet new friends but also practice Spanish in a real situation. Everyone has a great time – new friends, great food & drink and learning more Spanish. We are always looking at new and different ways to increase the value of classes with Spanish School for Residents and Expats. The Spanish School for Expats has always done more for students than just teaching Spanish. On Tuesday, July 25 a group of about 12 students met to have a great dinner at La Posada de Las Brujas in Escazú. The food here is excellent as is the service and price. This is a more typical Costa Rican venue and is almost always full. Since Tuesday was a national holiday there were even more people there and we had a bit of trouble getting a table for all of us together but the staff was able to accommodate us quickly – the staff is great! This was our first group dining event and by all accounts it was a great success. We will be doing more of these soon so stay tuned. We are planning more outside activities each month. Some we are considering are San Jose walking tours, La Feria market tours in Escazu, Museum tours and more dinner outings. Please let us know if you have an idea for a student group activity. We feel that these activities allow students to experience more of Costa Rica while at the same time speaking and practicing Spanish in a day to day situation. Also, students that are may be new to Costa Rica get to know other students outside of their group class and form new friendships. The annual student party will be Saturday, August 19, 2017 at the school. It starts at 11:00 AM and goes until everyone leaves. People will be coming and going all day so plan to come and stay all day or just a few hours – whatever your schedule allows. It will be a “pot luck” & B.Y.O.B. More information will be forthcoming so keep an eye out but mark your calendars now. It is always great fun with Wagner even teaching some dancing – as the night goes on! There are some other new things that are available on our website like the Spanish music, puzzles and more. “Flash Cards” are also available and are a quick and easy way to review anything from the alphabet, parts of the body to furniture items. One can study quickly and easily outside the classroom and it’s fun too. Here is the link: http://www.spanishforexpats-cr.com/student-resources/. http://www.spanishforexpats-cr.com/wp-content/uploads/2018/11/logo-spanishs.png 0 0 Wagner Freer http://www.spanishforexpats-cr.com/wp-content/uploads/2018/11/logo-spanishs.png Wagner Freer2017-08-01 19:19:312017-09-01 12:45:36The Spanish School for Expats has always done more for students than just teaching Spanish. Spanish is the majority language in 21 sovereign states and several dependent territories, totaling around 440 million people. In these countries and territories, Spanish is the main or only language of communication of the vast majority of the population; official documents are written chiefly or solely in that language; and it is taught in schools and utilized as the primary medium of instruction as part of the official curriculum. Though not an official language at the national level, Spanish is regularly spoken by significant minority populations in each of the nations and territories noted below. In each, public services and information are widely available in Spanish, as are various forms of printed and broadcast media. Spanish has been spoken in the United States for several centuries, particularly in the Southwest and Florida, which were all once part of New Spain. Spanish is the most studied foreign language in United States schools and is spoken as a native tongue by 41 million people, plus an additional 11 million fluent second-language speakers. It is also de facto official in the U.S. state of New Mexico along with English and is increasingly used alongside English nationwide in business and politics. With over 50 million native speakers and second language speakers, the United States now has the second largest Spanish-speaking population in the world after Mexico. In the United States, it is regulated by the North American Academy of the Spanish Language. The Spanish language is not official but also holds a special status (in the education system, the media, and some official documents) in the Principality of Andorra and the British Overseas Territory of Gibraltar, both of which share land borders with Spain. Spanish has no official recognition in the Central American nation of Belize, a Commonwealth realm where English is the official national language. However, the country shares land borders with Spanish-speaking Mexico and Guatemala and, per the 2010 Belizean census, Spanish is spoken by a sizable portion of the population; 30% claim Spanish as a mother tongue and about 50% of the population has working knowledge of the language. The Spanish-based creole language of Papiamento is the official language in Aruba, Bonaire and Curaçao. Chavacano is spoken in the Philippines, and Palenquero is spoken in Colombia; but neither is the official language in their respective countries. Judaeo-Spanish (better known as Ladino) is still spoken by some Sephardi Jews. Spanish was an official language of the Philippines from the beginning of the Hispanic period in 1565 and through independence until a constitutional change in 1973. However, President Ferdinand Marcoshad Spanish redesigned as an official language under Presidential Decree No. 156, dated 15 March 1973 and Spanish remained official until 1987, when it was re-designated as a voluntary and optional auxiliary language. On 8 August 2007, President Gloria Macapagal-Arroyo announced that the Philippine government asked help from the Spanish Government in her plan to reintroduce Spanish as a required subject in the Philippine school system. By 2012, the language was a compulsory subject at only a very select number of secondary schools. Despite government promotions of Spanish, less than 0.5% of the population are able to speak Spanish at least proficiently. While Spanish is designated as an optional government language in the Philippines, its usage is very limited and not present in everyday life. In the country, Spanish is regulated by the Philippine Academy of the Spanish Language. 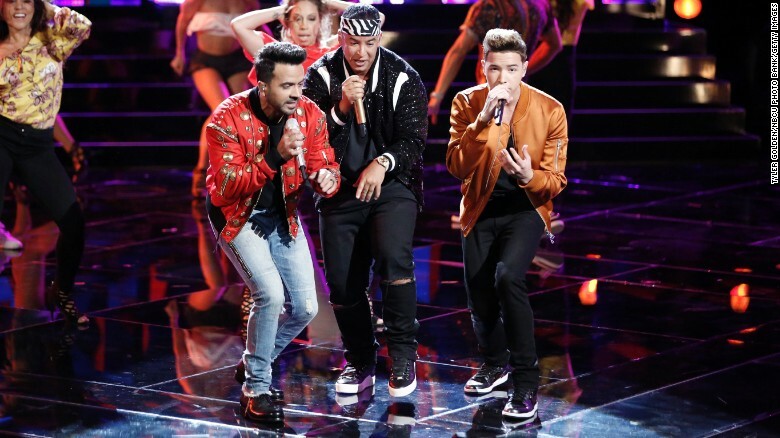 Luis Fonsi and Daddy Yankee perform ‘Despacito’ with contestant Mark Isaiah in ‘The Voice’ finale. (CNN) A wall may go up between the United States and its Spanish-speaking neighbor to the south, but nothing can stop the success of the nation’s current No. 1 hit song, which is mostly in … Español. The song “Despacito,” by Puerto Rican singer Luis Fonsi and reggaetón star Daddy Yankee is number one on Billboard’s Hot 100 for the third week in a row (it also features Justin Bieber). Although Latin influence in pop culture is not new, there hasn’t been a Spanish language song in the top spot since “Macarena” in 1996. While “Despacitio” has broken language and cultural barriers in the United States, some minorities, nonetheless, are feeling racial anxiety because of this particular moment in American politics. “It’s an interesting time we’re living in. Just when you think we’re living in a bit of a divided world, music is bringing us together, no matter the language! That’s what I’m most proud of,” Fonsi says. Daddy Yankee credits music as a universal language, bringing people together regardless of background or skin color. “People are more receptive to learn … connect and exchange their opinions in the digital world and learn more from one another,” Daddy Yankee says. “Despacito” also leads Billboard’s streaming songs chart with 65.4 million streams and digital song sales of 137,000 downloads. The music video was filmed in the streets of Puerto Rico, featuring locals playing dominoes and dancing. Fonsi told CNNE he wanted to show those who aren’t familiar with the culture how cheerful Latinos are and how prevalent music is in their daily lives. The woman turning heads in the video is Miss Universe 2006, Puerto Rican actress and model Zuleyka Rivera. “It has a feel-good vibe, with a great beat that provides an escape from some of our everyday issues and I think everybody can relate to that,” Fonsi says. “The main lyric is also easy to sing along to…des-pa-cito,” he adds. The majority of the Latin American countries, particularly in the South and Central America, speak Spanish with an increasing number of individuals living in the US. That is nearly a whole hemisphere filled with the Spanish language! There is also Spain, obviously, and while their Spanish may be somewhat different from the Spanish in the Latin America, it is still Spanish, and learning one makes the other much easier to pick up. The unfortunate issue is that native speakers of English find it very easy to be lazy. Tourism is geared up for English speakers, and English is the most spoken language in the world, making it difficult to muster up the motivation to learn a new language. However, being bilingual can really up your job prospects, for one thing. It can also provide you with a chance to live and work in the country which may be an unavailable option otherwise. It provides an alternative option for work and home, and with the many countries today that are able to speak Spanish, it provides a lot of people with several opportunities. In the worldwide statistics, Spanish ranks in as the third most spoken language, subsequent to Mandarin Chinese and English and positions as second, with regards to the number of native speakers. At the end of the 19th century, there were 60 million individuals who spoke Spanish. In the present day, there are nearly 500 million individuals around the world who can speak Spanish. Spanish is the native language of about 388 million individuals in 21 countries, including in Mexico, USA, Spain, Colombia, Argentina, Venezuela and Peru. It is extensively used also in locations where this language is unofficial but very popular. Hispanic customers are the speediest growing market section in North America. Their residents in US have increased by 60 percent in just a decade. This language is the second most used in international communication and is one of the official languages of the UN along with its associates. There are 29 million US occupants over five years old who speak Spanish at home. That is about one of every ten US occupants, a vast customer and trade market. The world is turning multilingual, with Spanish, Arabic and Chinese seemingly becoming the main languages of future. Nobody is conscious of the changing tides of trade more than those that are working in global markets. Thus, foreign language proficiency is an important advantage for job hunters as there are an increasing number of businesses trading internationally, and more jobs in the future are opening up to enable trade on this level. Latin culture carries on influencing globally with matters like on architecture, literature and art. Who is not familiar with Cervantes ‘Don Quijote de la Macha’, which is the second most translated book subsequent to the Bible? Who has not learned about the most expensive painting that was ever sold which was painted by Picasso? Santiago Calatrava is the Spanish architect that continues to make his mark throughout the world, with modern and up to date projects in Germany, Ireland, Sweden and the Olympic campus in Athens, as well as the site of world trade centre found in New York. The Spanish language authors such as Isabel Allende and Gabriel Garcia Marquez go on leading the global best seller lists as well as gaining international critical praise. The majority of the English language has a Latin origin, most of them originating by the way of French. Since Spanish is a Latin language as well, you will see when studying Spanish that you will have better comprehension of your native lexicon. Likewise, English and Spanish share Indo-European origins; this is the reason why their grammar is alike. There is probably no other efficient method to understanding English than by learning the grammar of another language, for the comprehension will force you reflect on how a particular language is structured. It is not odd, for instance, to acquire understanding of English tenses, moods and verbs by studying how these are to be applied in Spanish. These are some companies where our students come from!